Los Angeles Times. January 1, 2012. By Dalina Castellanos: The lawn at the site of the Occupy L.A. encampment is gone, but the park-restoration process is moving at a bureaucratic pace. Some would prefer to watch grass grow. Occupy L.A. protesters planned to leave their mark on City Hall’s park with graffiti declarations and treehouses when they were evicted in late November. Instead, they left behind a park stripped of its lush north and south lawns, creating a financial and planning burden for the city and a waiting game for the displaced farmers market that has held sway every Thursday. Ten-Fold Marketing: Growing Your Business by Growing Your Heart. Copyright 2012. By Marianne Carlson: You’ve heard it said that when you do something good for someone else, it will come back to you tenfold. 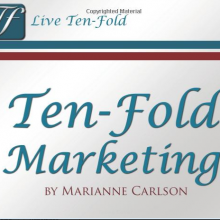 Ten-Fold Marketing tells the inspiring stories of successful business leaders across America who attribute their successes, at least in part, to the generosity they’ve shown. USGBC Green Home Guide. August 17, 2011. By Cassy Aoyagi: Earlier in the year, we looked at the benefits of putting our limited rainwater to good use with water catchment and infiltration strategies. Now that LA’s picture-perfect weather makes it tough to keep our gardens picture-perfect without irrigation, our teams field plenty of questions about graywater.. Unlike the other water harvesting strategies we’ve covered, graywater is always “re-watering” with already used water.